Tai O often comes as a surprise to tourists visiting Hong Kong. After all, it’s hard to imagine that this remote fishing village somehow manages to coexist in the same place as Mong Kok, Central or Wan Chai, which are its polar opposites. No, you won’t find skyscrapers, neon lights or luxury stores in Tai O. Instead you’ll find yourself wandering through narrow alleys with curious looking dried seafood, bamboo baskets of pink shrimp paste sitting in the sun, tiny temples by the sea, and traditional stilt houses, still used by the Tanka fishing community. This once isolated village on the southern tip of Lantau Island is no doubt unique, and with only one tiny winding road through the mountains for access, it is easy to see how Tai O has remained largely unchanged. The area where you arrive at the Taxi Stand or Bus Terminal is the entrance to town, where you will find a small market, with dried seafood, bakeries selling local treats (be sure to try some! ), interesting souvenirs, and some cafes. Follow this path and you’ll reach the bustling waterfront, with a drawbridge that connects to the other side. This is where boat drivers wait to take you on a ride to see the endangered pink dolphins of Lantau—another thing which has put Tai O on the map. 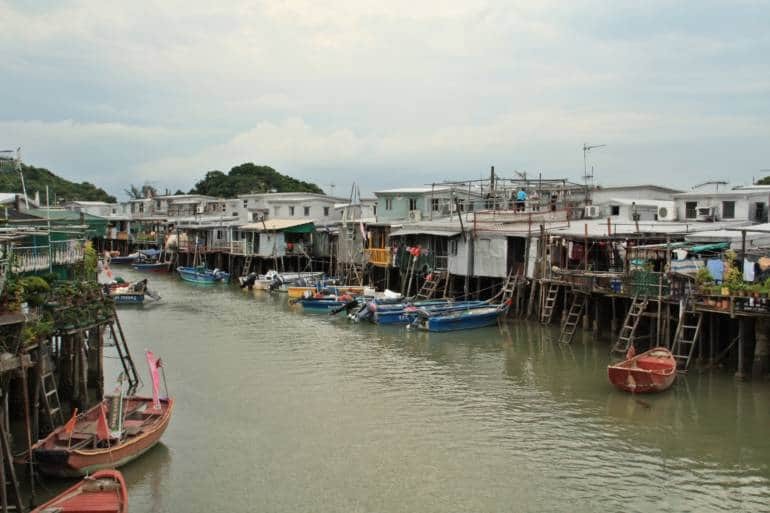 The waterfront is also where you’ll find the traditional stilt houses which Tai O is now famous for. A few years ago the Hong Kong tourism authorities tried to promote it as ‘The Venice of the Orient’, but if you’ve ever been to Venice, you’ll be sorely disappointed by the strange comparison. At low tide the muddy flats aren’t much to look at; it’s more picturesque at high tide, when you can see the boats come back to tie up for the night, and fishermen climbing the bamboo ladders up to the houses. If you have time to stay the night, the Tai O Heritage Hotel is really something special. A former police station from British colonial days, it has been converted into a beautiful hotel, with sweeping ocean views. 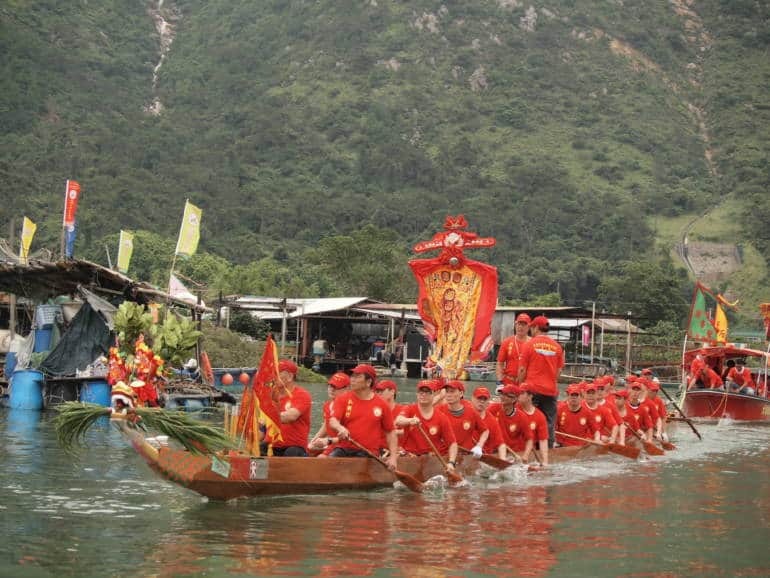 Tai O holds one of Hong Kong’s dragon boat races, and in 2019 it will be held on June 7th, so if you happen to be in Hong Kong in June, this is a great chance to see the entire town come to life for this local festival. 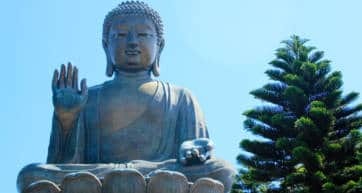 A day trip to Tai O is commonly combined with a visit to the Big Buddha, which is less than 15-minutes away. Most people take the Ngong Ping 360 cable car from Tung Chung up to the Big Buddha, and then catch New Lantau Bus #21 (or taxi) to Tai O. Ngong Ping 360 frequently has packages which include the cable car, ground transport to Tai O and back, plus a boat ride to see pink dolphins, which makes life really easy. >Alternatively you get to Tai O by taking New Lantau Bus #11 from Tung Chung, or Bus #1 from Mui Wo, though you’ll have to take a very pleasant ferry ride from Central to Mui Wo first. A note about taking taxis on Lantau: Hong Kong taxis have different colors for different zones. Blue taxis are the only ones allowed on South Lantau, which means you cannot ask a Red or Green Taxi to take you. Blue taxis are notoriously elusive, and on weekends the buses are full, so best to go on a weekday and avoid the transport headache. Accessible, but may need assistance going over the bridge. Wheelchair accessible public toilets are available.